A new learning-based approach is presented for particle detection in cryo-electron micrographs using the Adaboost learning algorithm. The approach builds directly on the successful detectors developed for the domain of face detection. It is a discriminative algorithm which learns important features of the particle’s appearance using a set of training examples of the particles and a set of images that do not contain particles. The algorithm is fast (10 seconds on a 1.3 GHz Pentium M processor), is generic, and is not limited to any particular shape or size of the particle to be detected. 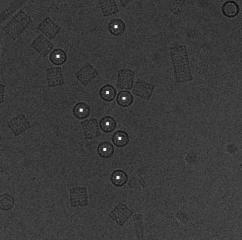 The method has been evaluated on a publicly available dataset of 82 cryo-EM images of keyhole lympet hemocyanin (KLH). From 998 automatically extracted particle images, the 3-D structure of KLH has been reconstructed at a resolution of 23.2 °A which is the same resolution as obtained using particles manually selected by a trained user.